In his first start since being acquired by the St. Louis Cardinals, John Smoltz looked, surprisingly, like his old self. The esteemed pitcher, whose season began with a long rehab stint and a string of terrible starts for the Boston Red Sox—he posted an ERA of 8.33 through 9 games, including a soul-crushing performance to kick off that ignominious four game sweep in the Bronx—was suddenly and mysteriously blowing hitters away en route to a win. Seeing Smoltz win a game was odd enough in itself. Even more confounding was watching him toss five scoreless innings in which he struck out nine batters, at one point fanning seven in a row. While I like a good conspiracy theory as much as the next guy, if for nothing else then to spice up the monotony of the everyday humdrum, Smoltz’s quick turnaround apparently has a much more reasonable explanation. According to the Cardinals coaching staff, Smoltz was somehow tipping his pitches to opposing batters. Essentially, hitters knew exactly what was coming at them before the ball even left his hand. Here’s Cardinals Manager Tony LaRussa on the matter: “It’s pretty clear he was tipping his pitches.” Not even a doubt about it from his new manager. So is that really it? Is that all it took to bring a proficient veteran back to form? Was he just flashing the ball around before each pitch, allowing hitters to get a clear view of his grip and thereby giving away what was on the way? Was he waving the thing around over his head? Walking to the plate and personally consulting with hitters to find out what they would like to see lobbed on over? What is even more intriguing to me is how the Red Sox pitching coaches never caught the problem. All it took for the Cards was a quick bullpen session before his first start. Apparently—and this, I should confess, is pieced together entirely from rumors and my own vibrant imagination—every time Smoltz entered the wind up, he produced semaphore flags from his back pocket and signaled his intended pitch with a few deft swoops of fluorescent fabric. I wish there was more of a concrete explanation for exactly how Smoltz could unwittingly offer up such an advantage to his opponents. Why at this point in his career? Was it an arm thing, coming off recent surgery as he was? Was Boston too much of a pressure market for a pitcher itching to prove his worth? 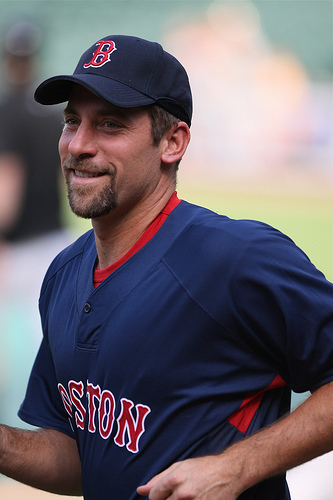 Or maybe Smoltz has a lingering hatred of the city. Maybe as a child he took a field trip which, to his immature sixth grader self, was criminally boring. Since that day, he has resented American history and, by extension, this historic city. Phoning in Sox starts could then have been his revenge, served delightfully cold so many years since. Whatever the reason, it’s a shame this problem got sorted out after Smoltz left for St. Louis. He could have been a good weapon down the stretch. If Boston gets bounced early in the playoffs—or before they even begin—we’ll be left to wonder what might have been if the guy had just buried the ball deeper in his damn glove.